← What’s the AER really up to shutting down Nexen’s 95 pipeline licenses? Protti trying to save his job? Make Albertans forget the courts ruled that the regulator owes no duty of care to anyone no matter how badly harmed, and can violate our constitutional rights with complete legal immunity? New air-quality tests in one of Canada’s largest petrochemical processing regions have revealed more evidence of short-lived but concentrated plumes of toxic chemicals. The tests by a Nobel-prize-winning lab at University of California Irvine echo previous results scientists have recorded for known carcinogens in the area northeast of Edmonton. “It is a snapshot, but it’s no fluke,” said Donald Blake, who heads the lab. Researchers visited what’s called Alberta’s Industrial Heartland — home to more than 40 petrochemical companies — in July 2012. They collected 96 samples of air nearby and in upwind rural areas. The results vary widely, although the majority are well under Alberta’s limits. But for July 8-12 of that year researchers found three days that had brief, dramatic spikes in levels of benzene, a known carcinogen for which there is no safe level. One sample reached 11 parts per billion, one was 24 ppb and a third was 156 ppb. “These are the kinds of numbers we don’t see in Los Angeles,” said Blake. Alberta’s recommended level is nine ppb averaged over an hour. The monitor of air quality in the region reports benzene exceeded that level only once during all of 2012. Blake suggested the short-term spikes may have been lost when averaged over an hour. It’s the third time his lab has come to the Industrial Heartland. Visits in 2008 and 2010 resulted in a peer-reviewed and published study in 2013 that found smog-causing chemicals at levels comparable to — and occasionally many times higher than — some of the world’s largest cities and industrial complexes. At least 10 of the chemicals found in the plumes were either known or suspected carcinogens. Researchers also found blood cancers in men in the three counties surrounding the heartland to be consistently higher over the years 1997-2006 than for neighbouring counties. No link was proven. The 2012 results have not been published. They were released to The Canadian Press upon the news agency’s request. Warren Kindzierski, a professor in the University of Alberta’s public Health department, called the results interesting, but said more data is needed to confirm whether transient puffs of tainted air are slipping by monitors. There’s a good statistical chance the high results could be an error, he suggested. Monitoring plumes is tricky, said Kindzierski, who’s been working with the Fort McKay First Nation near the oilsands to set up a program. A spokeswoman for Alberta Environment said air-quality guidelines followed by the Heartland’s monitor are set by a group including the government, environmentalists and industry. The spokeswoman, who was provided with the data from the California lab, declined to comment on its findings. Premier Rachel Notley didn’t hold back when she commented as the NDP environment critic on the same lab’s 2013 paper. Why was a 2012 Health Canada Report, admitting significant health hazards and risks to groundwater and air from hydraulic fracturing, kept from the public? 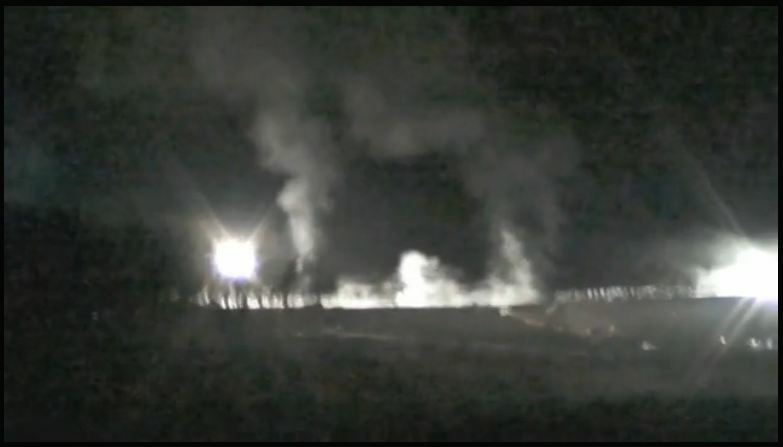 Source: FrackingCanada Night frac in Alberta. Hold your breath, all night long. David Kattenburg: Why aren’t these things being monitored for in the gases that are coming out from flaring and incineration stacks? Bob: The long list that you’ve identified would be the responsibility for monitoring of not only the Alberta Energy Regulator, but the Environment department themselves, and I would direct you once again to ESRD for them to identify what their plans are relative to updating those guidelines. Bob: Um, it is important, and this is something the Energy Regulator does lead, is capturing the metrics of the volumes of material, so we do have good metrics as to the volumetrics. David: But essentially nothing about the composition of those gases, other than sulfur dioxide. Bob: A totally accurate composition, I would certainly volunteer that no, we do not have a totally accurate comprehensive information on the flare composition rather, we have it for the uh volumes, but not necessarily for the compositions. This entry was posted in Global Frac News. Bookmark the permalink.